Last Friday I had a team stamping day at my house, which we like to do every 1-2 months. It's a lovely mix of both hobby demonstrators and those who would like to learn a bit more about getting classes happening at home or hosting workshops. Another fun part of the day is where the girls bring along the cards and scrapbook pages they have been making. This is particularly handy for new girls and there was lots of sharing and happy camera snapping going on. I love how everyone is so warm and welcoming to our new girls. 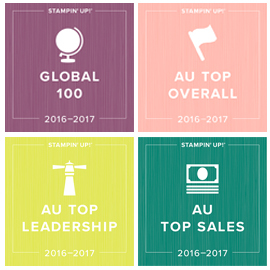 Did you know from tomorrow it now only costs $169 to become a Stampin' Up! Demonstrator? You can now choose exactly what you want to buy up to the value of $235 and you get the $80 catalogue and supplies kit and free postage, bringing the value of your kit to $315 for $169 investment. I am super proud of my team, which now spreads right throughout Australia. This is my 6th year of being a demonstrator and during that time I have been Australia's number 1 demonstrator one year, but most meaningful for me, number one for leadership and getting recruits off to a great start at various times too. This is the part I love the most, having a team and watching them enjoy the magic that being a demonstrator brings to their lives. I love the fun we have at get togethers and at Convention, the chatting, fun and support on our online forum and I love the way they are just so warm and welcoming and friendly to each other. If you have ever thought about becoming a demonstrator, I would love you to join our team, either with me or through one of my fabulous demonstrators if you choose. Either way you would get my friendship and support too and would be welcomed at my team events and receieve my team newsletter. Just give me a call on 03 9735 2946 or email me and ask me to call you. I will happily answer any questions you have and show you how easy it is to join online so your starter kit is on your way in the blink of an eye! Keep an eye out tomorrow for a great new special and also a fabulous blog hop with several of the Art with Heart team girls. Until then, have a happy smiley day. A quick and easy card today, thanks to the ease of using my BigShot and some matching Stampin' Up! punches and stamp sets. My colours are taken from the yummy Twitterpated DSP in the Autumn Winter Mini Catalogue. I am loving working with this paper. I have combined the coordinating cardstock colours of Baja Breeze and Blushing Bride and the coordinating ink colour of Not Quite Navy with it today. I love the texture you can add with dry embossing using the BigShot (this Stampin' Up! textured impressions embossing folder is Elegant Lines). The flower and Blushing Bride piece are also cut with the BigShot using the Fun Flowers Die (main Stampin' Up! catalogue) and Framelits (Autumn Winter Mini) respectively. My greeting is made using Perfect Punches (stamped in Not Quite Navy) cut out with the coordinating large Oval punch and matted with the Decorative Label punch. 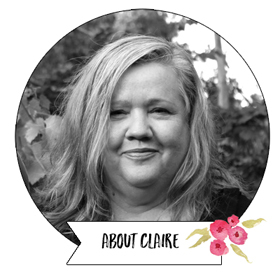 Anyone for a little Sweet Cake, Stampin' Up! style? Hello again. Today I have a card to show you that I created for our Art with Heart team Autumn Winter Mini card swap. It's a little different from my normal stamping style, but I loved doing it! I got my colours from the trusty Stampin' Up! Colour Coach, and the stamp set is one of the new sets in the Autumn Winter Mini. I am just loving the new colours we have available in the Bakers Twine now. I particularly love the Wisteria Wonder I have used here. I have also used the Scratch and Sniff Embossing Powder in Cherry on the cherry on top of the cupcake so it smells yum! The Dazzling Diamonds was quick and easy to apply using Tombow glue. My colours are Cherry Cobbler, Wisteria Wonder and Pink Pirouette (although I had to use Blushing Bride on the background as I was out on Pink Pirouette - I think Pink Pirouette would have been better so will use that next time). I hope you like today's card - let me know what you think! I'll be back soon as I am stamping again tonight. Just putting the finishing touches on the three cards for this months technique club, and then I think I might do some challenges. It's been wayyyyy too long. 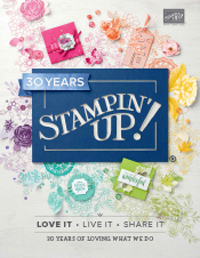 Looking for some Stampin' Up! Classes in Melbourne? The lovely Nikki Sadler runs evening classes in Aspendale Gardens. You can read all about Nikki's classes here. Next up is the lovely Sue Madex, who lives over the other side of town in Avondale Heights. Sue runs regular classes which you can read about here. Further south we also have the lovely Ros Davidson who runs classes in Skye. You can read all about Ros's upcoming classes here. In the meantime, here is another take on the card I posted yesterday. This time I used the negative section of the Framelit piece with the Bordering on Romance stamp set in the same colours as yesterday's card. Hello friends. Thanks for visiting. Today I have another mothers day card for you today (but really it could be any occasion by changing the sentiment using the fab greeting set Teeny Tiny Sentiments). This was one of a series of 3 cards I recently sent to my customers with a photo tutorial for 3 ways to use the Framelits for the Big Shot. 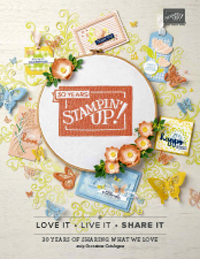 How beautiful is the new Stampin' Up! Bordering on Romance stamp set from the Stampin' Up! Autumn Winter Mini? I think this is my favourite mini catalogue in my 5+ years of being a demonstrator. So many yummy things! My colours here are Early Espresso, Pear Pizazz and Blushing Bride. I have also added in a little Rose Red in my watercolouring for a bit of shadowing on the flower petals. I hope you have a happy day and manage to get some stamping time this week. It's school holidays here in Melbourne so I plan to have a little at close to home fun with the boys as we were away last week for a few days in beautiful Apollo Bay. I will definitely be squeezing in some creating time, so pop back in a couple of days and see what I have been up to. Just a quick reminder mini catalogue shares are available until 17th April - all the details on my share page; and I also have the Scrap 6 Twitterpated scrapbooking tutorials and technique book by mail class sign ups happening this month.